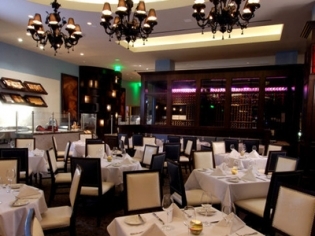 A steakhouse with a French flair, Morels impresses its guests with fine dining and a view of The Strip. Chef J.L. Carrera combines a traditional steakhouse menu with the aesthetics of a classic bistro. Wet & dry aged steak, cheeses from around the world, homemade meats & salamis, along with delectable desserts all add to the culinary delights offered at Morsels. Choose among a sunlit dining room, plush lounge or a patio with a view while appreciating the great tastes of cuisine sure to please your party of 1 or 300. Open for all meals and brunch on the weekends, this is a great place for a great meal anytime of day. Enjoy the iced seafood bar and the cheese and charcuterie bar.